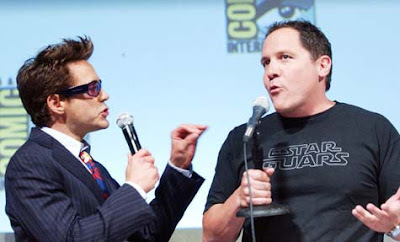 Downey Jr. convinces Favreau to play "Cowboys & Aliens"
Since we don’t have any “Batman 3” news to watch for obsessively, the next step down the totem pole of “people whose every move we follow” is Robert Downey Jr., especially when he’s in collaboration with his Iron Man franchise director Jon Favreau. The two will be working together on “Cowboys & Aliens,” a graphic novel adaptation that Downey Jr. has been attached to for quite some time now. Considering the original “Iron Man” script writers — Mark Fergus and Hawk Ostby — originally took to writing the script about a Cowboys and Native Americans dispute in the 1880’s Wild West that gets interrupted by a UFO, it’s not surprising Favreau was roped in. Now, the script is in the hands of gold mine writers Robert Orci and Alex Kurtzman (“Transformers” and “Star Trek”) and the movie has LOST producer Damon Lindelof on board, so you can bet all systems are go to get this thing filming next year and in theaters for a summer release in 2011. In other Downey Jr./Favreau news, Marvel and Paramount — creator and distributor of “Iron Man 2” — are allegedly fishing for estimates on what it would take to turn the highly anticipated sequel into 100 percent 3D. After all, if “Avatar” works out even in the slightest in 3D this winter, following that up with the first summer blockbuster ever in 3D in a movie that’s more of a surefire hit than “Avatar” sounds like a pretty smart idea.